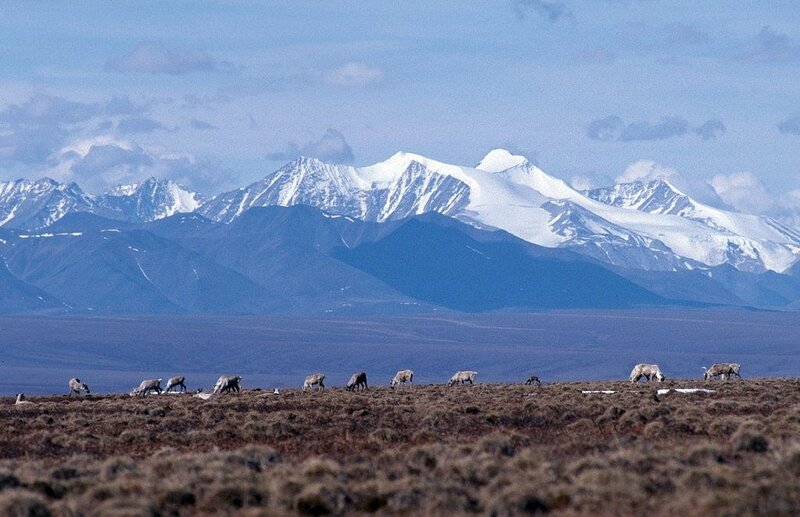 The Canadian territory is particularly concerned with potential impacts to the caribou herds who calve on the Arctic National Wildlife Refuge's coastal plain — and the Gwich'in people who depend on them for subsistence. While the Trump administration is preparing studies leading up to its planned oil leasing in the Arctic National Wildlife Refuge, the government across the border is launching its own analysis of oil development impacts. The government of Canada’s Yukon Territory — which opposes ANWR oil development — is on the verge of awarding a contract for a study of oil-development impacts on the Porcupine caribou herd. The herd, one of the biggest in the world, used the refuge’s coastal plain as its calving ground. That is the area that the herd usually uses for annual calving. The herd usually congregates on the refuge coastal plain starting in late May; the animals generally start their massive migration south in July. Because the herd roams on both sides of the border, it is the subject of a U.S.-Canada agreement intended to protect the animals and the people who depend on them, primarily the Gwich’in people of Alaska and Canada. Although the proposed oil leasing is within the U.S., Canadians have a stake in the outcome, Yukon officials say. “Government of Yukon is participating as fully as possible in the environmental impact process. We are a concerned neighbor and collaborative management partner and to that end we are participating to make sure that any relevant data we have is part of the process, as well as ensuring that our appreciation for the risks of development is conveyed,” Sophie Best, a spokeswoman for Yukon’s Department of Environment, said in an email. The territorial government will choose a contractor in the next few weeks for its study, Best said. The government accepted bids for the project through July 24. “The primary focus of the work will be an assessment of movement and demographic responses to proposed oil and gas development scenarios,” the tender document said. The analysis should identify places where oil development should not occur and recommend steps to mitigate impacts, the document said. A provision in the federal tax overhaul bill that passed Congress last December mandates at least two oil and gas lease sales in the coming decade in the ANWR coastal plain. Each sale must offer at least 400,000 acres, according to the bill. Even though the refuge is managed by the U.S. Fish and Wildlife Service, the U.S. Bureau of Land Management is overseeing oil-development plans, including the ongoing environmental impact statement. The Trump administration has promised a speedy review of any environmental impacts. Officials have said they want to hold a lease sale as early as next year, and the BLM is reviewing a proposal that would launch exploration work even before a lease sale is held. The agency is reviewing a proposal from SAExploration Inc. to do seismic surveys in the coastal plain starting late this year.